Be prepared: 10 Essentials checklist and sound advice. Plan for the unusual experience. Think beyond just driving your car to the trailhead and jumping out to start hiking. Navigation: Note that a GPS requires batteries; a compass does not. Sun protection: sunglasses and sunscreen, even in the winter. Insulation: an extra set of clothes to keep you warm in a worst-case scenario. Illumination: a headlamp, flashlight, or lantern with extra batteries. First-aid supplies: treatment for blisters, a few bandages, adhesive tape, pain relief, and disinfecting cream or spray. Fire: waterproof matches stored in a watertight container — bring more than you think you’ll need. Some sort of fire starter, like dry tinder, lint, or any number of commercially available products. 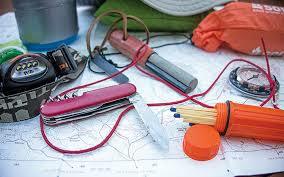 Repair kit: duct tape and a knife or multitool. Extra Nutrition: extra energy bars, trail mix, jerky, or freeze-dried meals. Hydration: water bottles, and also a water filtration or purification system. Shelter: depending on the length of your trip, this could range from a tarp (that could be used to make an emergency shelter) to a sleeping bag or tent.